The cost of statistical computing software has precluded many universities from installing these valuable computational and analytical tools. R, a powerful open-source software package, was created in response to this issue. It has enjoyed explosive growth since its introduction, owing to its coherence, flexibility, and free availability. While it is a valuable tool for students who are first learning statistics, proper introductory materials are needed for its adoption. Using R for Introductory Statistics fills this gap in the literature, making the software accessible to the introductory student. The author presents a self-contained treatment of statistical topics and the intricacies of the R software. The pacing is such that students are able to master data manipulation and exploration before diving into more advanced statistical concepts. The book treats exploratory data analysis with more attention than is typical, includes a chapter on simulation, and provides a unified approach to linear models. This text lays the foundation for further study and development in statistics using R. Appendices cover installation, graphical user interfaces, and teaching with R, as well as information on writing functions and producing graphics. 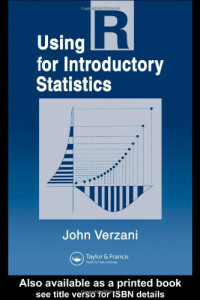 This is an ideal text for integrating the study of statistics with a powerful computational tool.